The Lodge of Fusaro is another architectural delight built by Charles and Ferdinand. It is located in the area called “the Acherusia Marsh” in ancient times and believed to be the seat of the Infernals. In 1752 King Charles bought the Fusaro and created, just in the middle of the lake, on a natural granitic layer, an “octagonal lodge”. Ferdinand IV in 1782 tasked Architect Charles Vanvitelli, son of Louis, with the design and realisation of a hunting residence, the Royal Lodge of Fusaro. Six “basements” destined to host the royal stable and an “inn for the guests spending there their leisure time” were built; the ancient mouth of Torre Gaveta was restored and, most of all the farming of oysters, of which the King was very fond (he even enjoyed himself in selling the fish and oysters of the Fusaro) was increased. On the bank of the lake, “several edifices were built, one called Baraccone, including a huge canopy supported by arches and pillars to shelter boats and fishing tools belonging to the Royal family”; another called Cassone, to keep “fish alive for selling”. 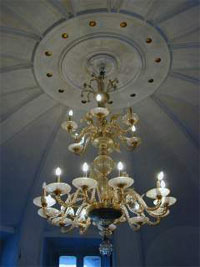 And therefore the once guardian house became the “Royal Lodge” in the middle of the Fusaro area. Only subsequently would the wooden pier be built, whereas the “Little Oyster (Ostrichina), i.e. 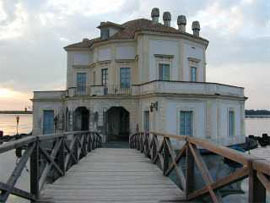 the villa on the bank, designed by the Royal Architect Antonio De Simone and inaugurated in 1825, had also a wide area for the stationing of the royal carriages. Many important events and distinguished guests inhabited it. For instance, on 15 May 1819 King Ferdinand gave a lunch in honour of the Austrian Emperor Francis II at the Fusaro. But if from an architectural point of view this monument is linked to the prestigious name of Charles Vanvitelli, from a decorative point of view it refers to one of the most important landscape painters of the 18th century: Philipp Jacob Hackert. This structure is formed by two storeys superimposed but not similar. The lower one is wider due to two ambulatories located at the sides of frontal arches, one north and one south. Between these two rooms and the central hall there are two semicircular rooms one north and one south used respectively as corridor and staircase room. These areas were transformed into kitchens, staff lodgings, storeroom and, later on, offices. Presently, from October 2001, the ambulatories have been transformed into “gallery of distinguished guests”. biographies and reasons of link with the prestigious people who have marked the European history for more than two centuries and who were guests at the Royal Site of the Fusaro. The whole Bourbon dynasty, the Tzar of Russia Nicholas I, the Prince of Metternich, Francis I Emperor of Austria, Joseph II of Habsburg-Lorraine, Sir William Hamilton, and Gioacchino Rossini and Wolfang Amadeus Mozart, just to mention a few. Vanvitelli and Hackert, through their creative talent, did even more. The main floor had a marvelous floor whose background colour was a pastel blue with floral decorations and multiform yellow decorations. 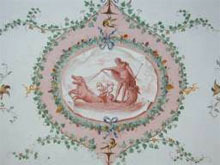 The ceiling was finely frescoed with hunting, fishing and natural scenes. The walls were covered by what Hackert himself – while addressing J.W, Goethe – defined as the best work made for the Neapolitan Court: the cycle of the four seasons. The artist thought of alternating each season with the panorama that is possible to see from the wide windows. In fact, the life-size paintings covering the whole wall presented the horizon landscape as coinciding exactly with the natural horizon of the lake without any break. A complete fusion between his masterpieces and those generously distributed by nature around the lake. A summary of all the places Ferdinand IV loved most. Unfortunately, Hackert’s masterpieces disappeared during the Neapolitan Revolution of January 1799. The original floor was removed after the second world war. The less striking yet brilliant work was the roof, supported by a complex system of beams and trusses that guaranteed great weather-proof, but also great resistence against the volcanic nature of the Campi Flegrei plain. A panorama of exceptional beauty can be admired from the Lodge and, in particular, the sunset is a unique sight that has enraptured and still enrapture with unchanged intensity powerful people, artists and commoners. 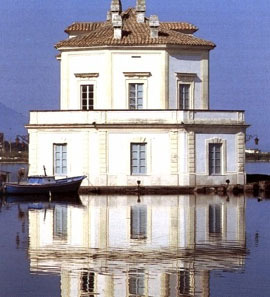 In bright days, the image of the Lodge reflected on the calm and crystal-clear waters of the lake as in a mirror is highly suggestive, as it is the view of real fish colonies drawing strange geometrical figures while making extraordinary somersaults among the cliffs, or the view of the “rocchi”, the rocks ordered by King Ferdinand IV and piled up in a sort of basin, on which the fagots with the oysters were laid so that oysters could not be in contact with the mud, now scattered like craters around the little island. This place has been many times defined as an enchanted place, an architectural jewel on crystal-clear and silent waters. Maurice Coste, sent by the French government to study the oyster farming of Fusaro, said it was a miracle “to be repeated in France, too”. This place is a jewel admired by geniuses such as Mozart and Goethe.